Philadelphia-based David A. Parker and State College-based Susan Marie Brundage show together at Street Road and also at a satellite exhibition at the nearby Christiana Motel. Parker's Time Switch and Brundage's Precious draw out themes of excavation and layering, and point beyond human time scales, evoking currents in post-humanist studies. Of Time Switch, Parker writes: "This series arises from my ongoing efforts to maintain a view of existence, specifically of our "life-time," that eludes conventional bounds. I want to do this because regarding time from a range of perspectives can prompt reconsideration of what is important - a resetting and recalibration of priorities for our brief lives." 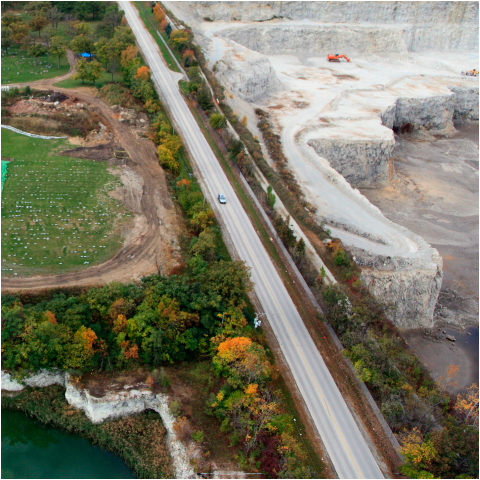 Parker's 15-photograph set, accompanied by interpretive poetic texts, starts from a temporally resonant site in Chicago: a limestone quarry adjoined by a cemetery (above). He writes, "Here, human life-time joins the epic flow of geologic time. The quarry contains countless beings, fossilized millions of years ago under a sea that has since vanished." Brundage's Precious is a series of gouache paintings of open pit mining sites around the world. She has stated "This type of mining digs away enormous layers of earth creating very large craters in order to expose the mineral deposits to be extracted. I am particularly interested in open pit diamond mines and the geological devastation they create to extract these sparkly little stones that our culture deems more precious than the actual Earth that they come out of. Many times once these mines are exhausted, the hole remains as a permanent scar on the land, and if proper remediation is not done, this scar sometimes can become more toxic than the actual mining that created it." Shown in separate rooms at Street Road this winter these two series sit in dialogue with each other: both bring our Anthropocene Age into focus, inviting us to reconsider our understanding of ourselves in relation to our planet, and to time. In Street Road's first local satellite exhibition, Brundage and Parker each show works which complement each other, and relate closely to the site of exhibition itself - The Christiana Motel. Brundage's Interstate Americana paintings depict road-side scenes from her travels around the United States; in particular, sites she finds evocative of a kind of extraordinary ordinariness. She writes: "I like to create an almost magical space for these profoundly mundane locations. Ultimately, the intent of the work is to make the viewer more sensitive in a small way to the environments that exist around them, even though they represent things most people simply ignore." Parker's Enskyment series continues his project of bringing into focus extra-human time scales. An outdoor sculptural installation, Enskyment consists of a self-portrait made of bird seed, which is fitted with a motion sensor activated camera. The work is slowly eaten away over time by avian visitors, metaphorically transmuting the artist's body and taking it into the sky. The camera captures these visitors as they make their brief stopover at the sculpture. Enskyment has been installed at Street Road's main site for the past year. We're excited about its relocation to the Christiana Motel, itself a temporary stopping place and 'locus' for travelers from all points of the compass. Postcards with photographs of birds who 'check in' will be available in the motel lobby for the duration of the show. Together these works sit in close relation to the activity on site at this traveller's haven, continuing and expanding Street Road's program of site-engaged art.